The house where we live now is our family house which we inherited from my grandparents. It was built in the 70's so it's already old and the roof needs repair because it has already some leaks. I was wondering if Columbus roofers can give us a good estimate on how much the expenses would cost us to have the roof repaired. I heard positive reviews about their work and I'm pretty sure they will do their job well so I can get my money's worth. The house has a sentimental value to me because this is where my siblings and I were born and grew up. I spent most of my life here and it's kinda hard to leave it just like that. My hubby wanted to move to a bigger house with a spacious yard but I was thinking of the rent. Why rent a house if we have one for free. I think it is not practical so I didn't agree with his plan. The house is actually like a duplex because my brother and his family live next door. That's the reason why hubby wanted a bigger house. Hubby is from the lone star state and they said that everything is big in Texas. That I have to agree. Our house and lot that we sold there a few years ago was a lot bigger than our house now. But then, we have to be contented with what we have now. Anyway, hubby and I both know that everything in this world is just temporal. We can't take our house to the grave. Though you have a mansion or a palace here on earth, you will leave it behind when it's your time to leave earth. What is important is that we both know that we have a mansion waiting for us in heaven. 1. Get Great Crane Products. If you're like most construction companies, you make use of cranes almost every day. As such, you want to ensure that your equipment is up to date, durable, and high quality. Doing so can prevent injuries and optimize your construction company's daily functions. When you start the search for the ideal company from which to purchase your crane products, consider the professionals of ProServCrane Group. With extensive knowledge and hands-on industry experience, the company is pleased to offer clients the goal-oriented, customer centered services they need and deserve. Visit this website (http://www.proservanchor.com/) to learn more about the company. In recognizing that you are competing with other construction company business owners to win the attention and loyalty of the public, it's important that you increase brand recognition and make your company the only one that the target market is thinking about. The key to putting this process in motion is to consistently advertise. Although many business owners think that advertising is a magical or mysterious process, it isn't. Successful advertising is all about using research and analytics to determine the client's target market and subsequently implementing a targeted campaign that generates interest in the brand and subsequently turns the prospective customer into a loyal brand ambassador. The internet makes it easy for construction company business owners to go online and do research for the purpose of finding the most suitable advertising company to represent them. While running a construction company can be personally and professionally rewarding, it is also an endeavor that necessitates a competitive edge. To ensure that you leave other construction companies in the dust and come out on top, be sure that you're getting great crane parts and optimizing your advertising efforts. Good luck! It's been a few days since I celebrated my birthday. I've been too busy so its only now that I found time to post it here in my blog. I thank God for another year that He added in my life. I consider it a blessing that until now I am alive, cancer free and stroke survivor. If you only knew how it feels to be stricken with cancer and was dying many years ago, then had a stroke 7 years later that made me so weak and had to stay in the rehab hospital for more than a month then you will understand how grateful and and thankful I am that the Lord had answered my prayers, healed me and gave me a new lease of life. 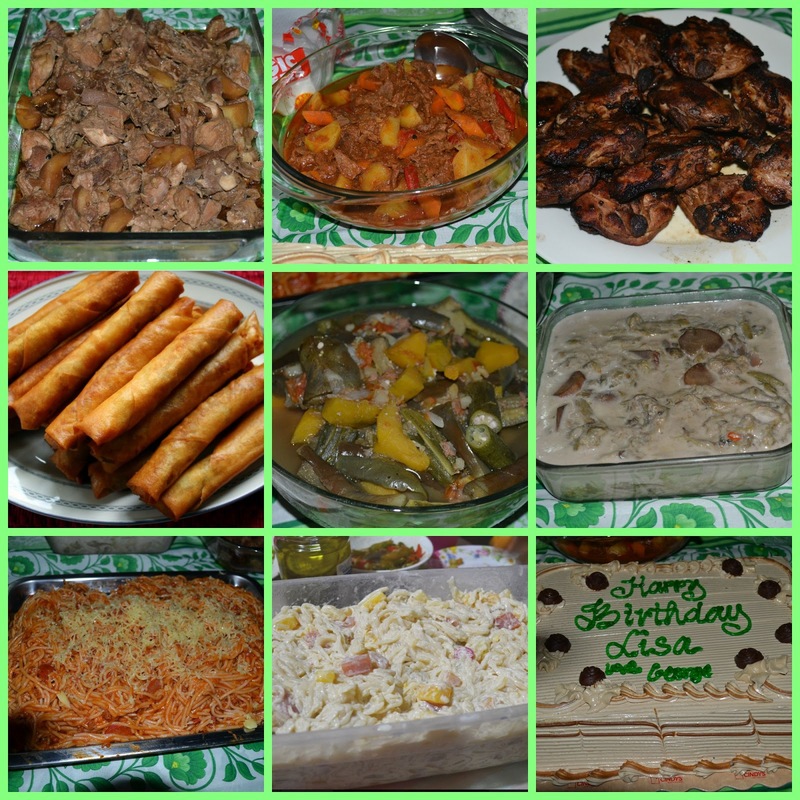 To celebrate my birthday, my helper Jojo and I cooked foods for my invited guests, friends and neighbors. She started cooking in the morning and finished it around 6PM. She cooked first the beef menudo, beef mechado, chicken and pork adobo, pinakbet, ginataang gabi and the shanghai lumpia which I prepared the day before I know she was so exhausted and tired. I helped her prepared the ingredients and she did the cooking. Jhun cooked the spaghetti sauce and my brothers cooked the spaghetti pasta, rice and chicken barbeque. I made the aga-agar salad the night before and hubby bought my birthday cake. Some of my friends (teachers) from the LNHS whom I used to work with came too. Dinner started around 6:30 PM at our carport. Jojo was so delighted when they told her that the foods she cooked were delicious. Just hearing the compliments made her tiredness vanished. Everybody got full and satisfied. We have quite a few leftovers and we ate it for a couple of days. I thank the Lord for all the blessings he bestowed. To God be the glory! And here's a gift for me from Rosalie. It's a pink beaded purse. So cute.